Call it unprofessional attitude of drivers or company; at the end the money minting game and root service providers are making customers suffer. In the Morning when Sheetal of Phase 4 Mohali has to see a doctor for her Physiotherapy, she booked Uber cab and the driver refused to take the call as there’s been a chaos in Mohali. While asking what happened, driver replied that strikers are breaking cars on road and it is due to changing in the policies of Uber company. Well, Sheetal got her cab booked again with Uber, but she remain scared all time in travel forbidding if some tragedy would happen. As same like Sheetal, here is a story Amrinder Singh of sector 69 who was coming all the way back from Fortis Hospital, suffered the heat of annoyed Uber Strikers. They broke the windows and Amrinder got injured being a customer. As per the policies of Uber, they considered their service providers as their partner. As per Uber Drivers there is no limit of engaging new cars into the services. Everyday there are 25-30 cars get attached with Uber Services. As of now, there are more than 15000 cars attached with Uber Services in Tricity, due to that old service providers gets affected as they do not get as mush rides as they used to had earlier. Efven they are stopping Ola drivers also for their demands. Moreover, Company is promoting discount services to the customers and these discounts are paid from the pockets of service providers. Company is not paying that from its own pocket. 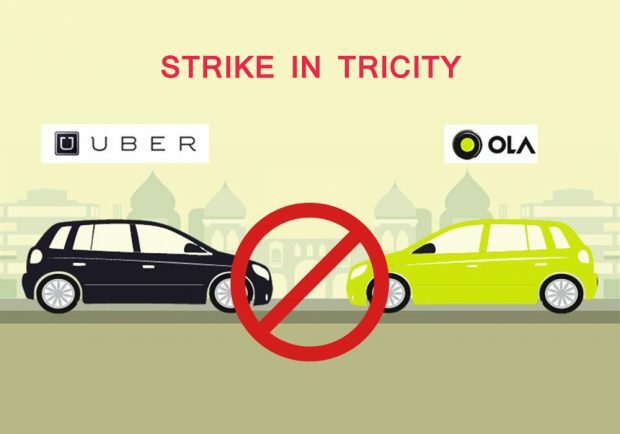 Heres the video of Mohali Uber strikers…Watch out….